Medicinal uses: For their astringent properties, to treat diarrhea and as a gargle for mouth or throat infections, and as an ingredient in teas. Also tones the uterus helping to ease labor in childbirth. Nutritional information: Raspberries are an excellent source of fiber, manganese, vitamin C, flavonoids, and ellagic acid. They are a very good source of vitamin B2 as well as a good source of other B vitamins, such as folic acid, niacin, pantothenic acid, and vitamin B6 (Murray 312). 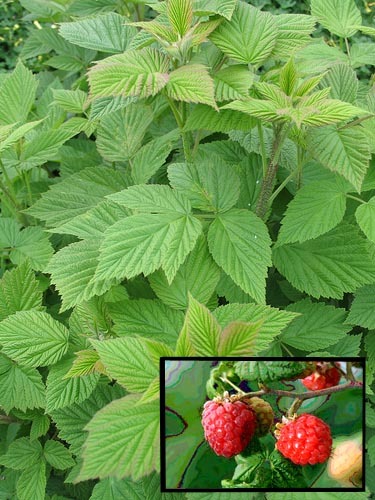 Cautions: Some recommend not taking raspberry leaf medicinally during the early stages of pregnancy. Others recommend the use of this tonic plant throughout pregnancy (Chevallier 263, Gladstar, Romm).